In what was later admitted to be a knee-jerk reaction, Clearview Regional High School students in Gloucester County, New Jersey, were forced to take down their project, which focused on police brutality statstics within their community. The project, which was done as part of an awareness campaign in a humanitarian studies class, faced backlash from parents, community members, and the local Police Benevolent Association for its depiction of the controversial subject: the role of police and policing within American society. The display included a cutout silhouette of a person raising their hands surrounded by statistical information regarding crime and police brutality within the Clearview community. Juxtaposing quantifiable fact to the very real human aspects of policing, several people jumped to a gross and all too simple conclusion about the meaning of the project. They viewed it as a condemnation of police and the police force as opposed to what the project was really meant to depict: the complex relationship among the facts, the dangers that police face as protectors, and ultimately the fact that police are members of the community as well and not infallible. 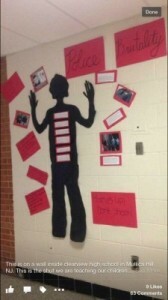 In response to the negative feedback that the display received, the school had the display taken down. Instead of the piece inciting conversation about an issue that many communities are facing in this day and age, the school reacted as many others have and opted to censor the possibility for conversation within their academic community altogether.